Home » Games » Things We Know About Sekiro Shadows Die Twice So Far! Sekiro Shadows Die Twice – the newest IP by FromSoftware was fully revealed in E3 2018 and oh boy does not it look awesome. 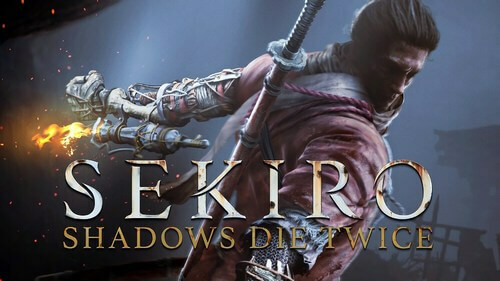 Since this is a new title coming from FromSoftware, many people wishes Sekiro Shadows Die Twice to bring something new to the Dark Souls formula. And true, FromSoftware has done so much on this game, to the point that it is like a brand new game with brand new formula despite borrowing certain element from Dark Souls. So what is this game about? Let’s check out all things we know about Sekiro Shadows Die Twice so far! 1. What is Sekiro Shadows Die Twice? Sekiro Shadows Die Twice is a brand new action-adventure game made by FromSoftware and published by Activision. It was first teased in The Game Awards 2017 with a mysterious, Japanese-vibe teaser. Then in E3 2018, the game was fully revealed with clearer trailer and gameplay demo. Also just recently in Tokyo Game Show 2018, FromSoftware showcased a second trailer and revealed more of the gameplay demo, including an awesome boss fight. The game features many differences compared to its Souls-Borne predecessors like the lack of stamina bar, resurrection element, etc… But through and through, this is truly a FromSoft game; it is brutally hard yet extremely satisfying when you succeed. Sekiro Shadows Die Twice is scheduled to be released on March 22, 2019. It has been a very long time since FromSoftware made a Japanese-setting game. Their latest Japanese-setting game before Sekiro Shadows Die Twice was probably Tenchu Shadow Assassins in 2009. And talking about Tenchu, Sekiro Shadows Die Twice is like a Tenchu-Souls hybrid. The game sets in the 1500s Sengoku-era Japan, specifically the Warring States, when a shinobi named Sekiro who was in charge of protecting his young lord. However, he was defeated by a samurai who cut off his left arm and kidnapped his master (explaining why he has the name Sekiro which literally means “one-armed wolf”). Afterwards, Sekiro found himself in a temple where he met an old sculpture, who is supposedly the one who gave Sekiro the prosthetic arm. And so, Sekiro sets out to save his master, ideally in “ninja way”. Just like Souls-Borne games, Sekiro Shadows Die Twice features a semi-open world which includes multiple areas connected with each other. 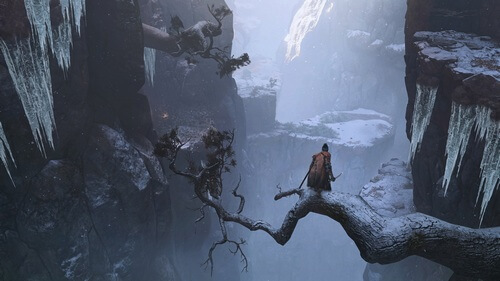 But unlike traditional Souls-Borne maps, the world in Sekiro Shadows Die Twice is supposedly inter-connected, both horizontally and vertically. This actually makes a huge difference since Sekiro features a much, much more mobile movement, especially the jumping and swinging mechanics. Players will be able to get on higher areas like tree branches, rooftops, hills, etc… This opens a much, much better opportunity to explore the world from multiple sides. And considering the stealth elements in this game, being able to get on the high ground, scout the surroundings, and kill enemies from above always feels fun. Run – Jump – Swing! Yes! In Sekiro Shadows Die Twice players will have much better mobility than Souls-Borne games. This is all thanks to the two main differences in this game: jumping and swinging. In Souls-Borne games, players’ characters tend to feel like sticking on the ground. In order to jump, players will have to run first, and then they can jump. However, in Sekiro Shadows Die Twice, jumping is assigned to a fixed button and players can jump freely without needing to run first. 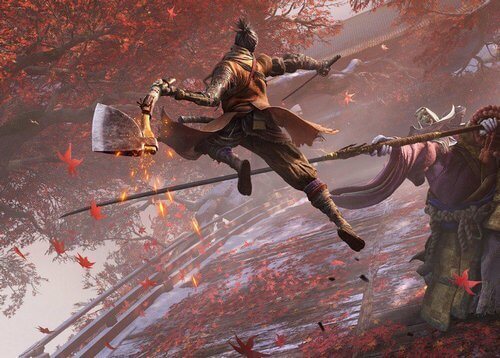 Then on top of jumping, there is a brand new swinging mechanic in which Sekiro can launch his Grappling Hook to grab on a higher area like tree branches or rooftops, then swing himself to that area. As we said, these two great changes bring a whole different way in moving around in this game. Players can get on higher ground to explore, scout the area, and assassinate. And the best part? Players can even jump and swing during combat! For some people, this may not sound like a big deal since many other action games do this. But if you are a Souls-Borne players, you will understand how big of a deal this is. 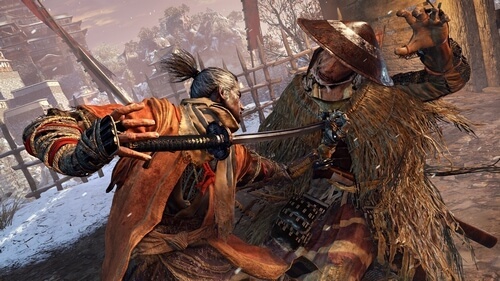 Unlike previous Souls-Borne titles, Sekiro Shadows Die Twice emphasizes more on the assassination element rather than straight-up combat. 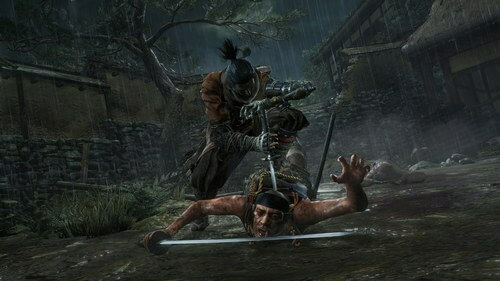 Basically, players can perform Shinobi Deathblow on enemy when approaching behind them silently by crouching. For better stealth performance, FromSoftware also puts in hiding spots like bushes so that players can crouch in without being detected. And as we said above, players can get to higher ground and thus, jump down and assassinate enemy from above (imagine it’s like a more badass version of plunging attack in Souls-Borne games). Of course, focusing on stealth actions also means there will be some sort of indicator to warn players that enemies are on alert. If an enemy gets suspicious, there will be a white triangle sign appearing on the enemy’s head. And if the white sign fills up, it will change to yellow which hints that enemy is on full-alert. Then it can quickly change to red which means the enemy has detected Sekiro and they will chase him down. Due to the high difficulty in this game (which FromSoftware stated a lot that it will be much harder than Souls-Borne games), the game tends to encourage players to do stealth actions rather than simply rushing in combat. However, one thing to note though: there are certain enemies who have multiple health bars and therefore, assassinating them in one hit is literally impossible. Another huge difference in Sekiro Shadows Die Twice is that: it does not have Stamina Bar. That’s right! There will be no Stamina Bar in this game, which means players can freely perform any actions without worrying about Stamina capacity. But that said, it does not mean that this game is going to be easier. Again, FromSoftware stated that this game is going to be more difficult than their previous Souls-Borne games. And yeah, instead of Stamina bar, they have put in a totally new mechanic called Posture. To certain extent, we can imagine Posture to be like “stance” in real-life martial art. Posture determines your vulnerability in combat (somewhat similar to Poise in Souls-Borne games). 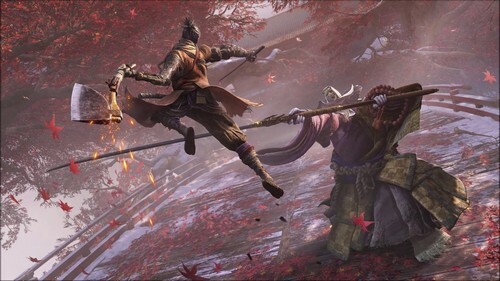 When engaging in combat, we will see a Posture Bar below the screen indicating Sekiro’s Posture, and Posture Bar appearing above a normal enemy’s head or Posture Bar on top of the screen indicating Boss/Mid-Boss’s Posture. 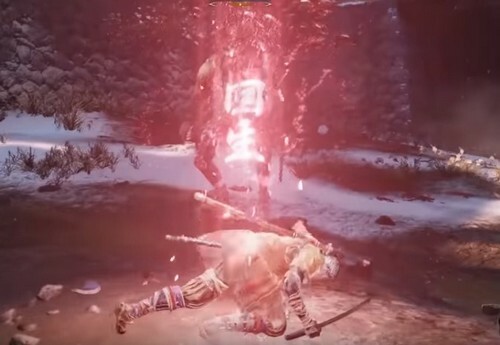 If the enemy’s Posture Bar fully fills, enemy’s Posture will be broken and they will be vulnerable from Sekiro’s Shinobi Deathblow which instantly kills a normal enemy, or destroy one health bar of Boss/Mid-Boss. If Sekiro’s own Posture Bar fully fills, he will fall into staggered state which leaves Sekiro totally defenseless from enemy’s attacks. And so, the goal in this game’s combat is to fills up enemy’s Posture Bar, while keeping Sekiro’s own Posture Bar low at the same time. To fills up enemy’s Posture Bar, players can try inflicting direct hit on enemy. If the enemy parries, their Posture Bar will still increase yet in slower speed. In case of Mid-Boss/Boss enemies, these guys can have like 2 or 3 Health Bar, which means players will have to perform Shinobi Deathblow 2 or 3 times in order to finally kill them. Another great way (and also recommended) to fill up enemy’s Posture Bar and protect Sekiro’s own Posture Bar is to perform Perfect Parry by hitting Deflect button (LB) at the right moment. If players do not pull out a Perfect Parry, the Deflect action will still be made, yet Sekiro’s Posture Bar will fill up and he will more likely be staggered. So what if you manage to reduce your enemy’s HP to near 0? Well sad news is enemy won’t just die. Killing enemy in this game requires Shinobi Deathblow and that means; you will have to focus on filling their Posture Bar rather than dealing damage to them. Yet don’t worry, reducing enemy’s health can still be helpful since the lower their health is, the weaker they will become. As the results, mastering Posture and Deflect mechanics is essential in every fight, especially Mid-Boss/Boss fight. If you have already watched the gameplay demo, you will see that fighting in this game can be extremely tough. Taking a hit even from a normal enemy can cost you around 25% or 30% of your HP. Ideally you will only want to fight one-on-one at a time. 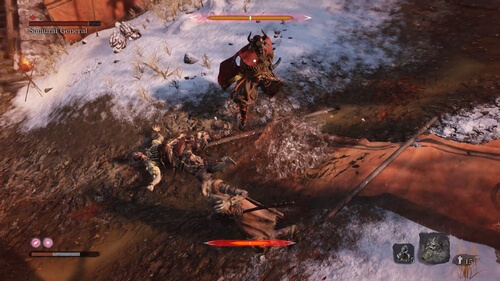 Pulling multiple enemies, especially including Mid-Boss (like the Samurai General in the demo), can prove to be foolish. In the demo, solo-ing the Samurai General can be extremely frustrating if you don’t figure out this Posture mechanic. But once you do, you will be able to enjoy awesome swordfight – the dance of swords clashing together and ultimately, giving your opponent a nice-clean kill with the Deathblow. For those who are familiar with Souls-Borne games, you know that almost all weapons in this game are usable, depending on your character build. Each weapon has its own unique properties, movesets and therefore, there are a great sense of experience and experiment with different weapon. However, Sekiro the main protagonist will only have one main weapon – his katana. 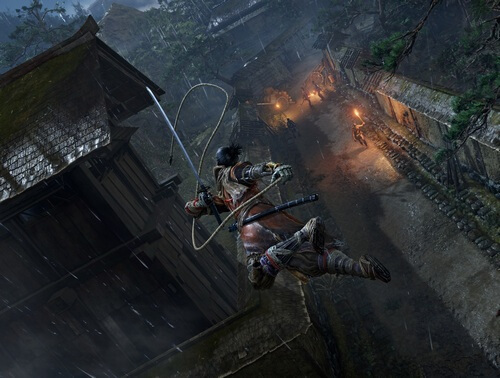 Grappling Hook: This is an awesome tool which allows Sekiro to swing to the high grounds. It can even hook at enemy and pull them towards Sekiro or quickly pull Sekiro himself towards the target. Shuriken: This is the good ol’ metal stars – popular ninja tools in many films, manga/anime, and games. 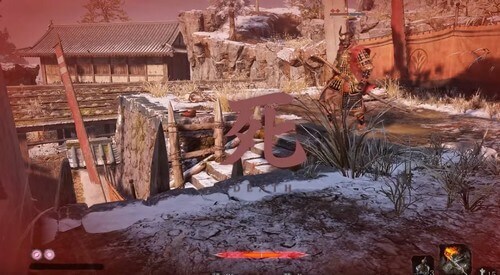 In this game, Shuriken acts as Sekiro’s ranged weapons. Also, it provides a sweet attack modify which allows Sekiro to quickly dash towards enemy while attacking with his katana at the same time. And if you understand Souls-Borne, you will know that quickly closing gap with your enemy is extremely powerful. Axe: This axe is attached to Sekiro’s prosthetic arm and it can be used to launch a heavy attack which can breakthrough enemy’s shield or stagger enemy. It is pretty powerful, yet its attack speed is slow. Interesting enough, it is much faster when Sekiro perform air attack. Flamethrower: Just like its name, this gadget bursts a line of fire towards target, burning them in the process. If Sekiro perform a quick attack immediately after firing, his sword will be imbued with fire (imagine it’s like Fire Paper in Bloodborne or Charcoal Pine Resin in Dark Souls). 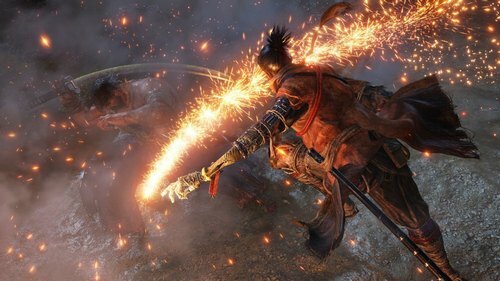 Firecrackers: Sekiro seems to ignite a firecracker and spread its fire in a line before him, potentially preventing enemy from engaging him. 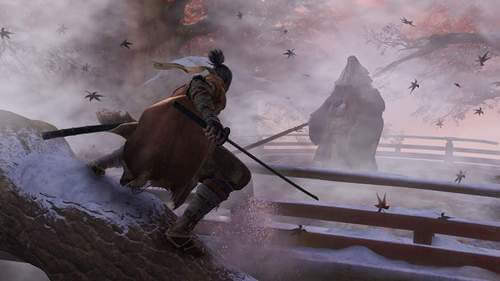 Fan Shield: Sekiro unleashes a round, retractable metal fan which can block an enemy’s attack. Spear: This one has just been revealed in Tokyo Game Show 2018 trailer, Sekiro equips a retractable spear in his prosthetic arm. When used, he launches the spear forward, stabbing the target and pull it towards him. All of these gadgets provide a deeper depth into the game’s combat. However, you won’t be able to spam them since they require item called White Spirit Emblem. Different gadgets will consume different amount of these emblems, and these emblems seem to able to get from killing enemies only. Like Souls-Borne games, Sekiro literally never dies in this game. Every time he dies, he will be resurrected at the Sculptor’s Idol (which is literally the Bonfire version of this game). But unlike Souls-Borne games, Sekiro Shadows Die Twice adds a new element which allows Sekiro to resurrect right after his death. Basically, when Sekiro dies, there will be 20 seconds countdown in which players can decide whether they want to resurrect or not. During this period, nearby enemies will move away to their usual post as they believe Sekiro is dead. If players choose to resurrect, Sekiro will come back to live with half of his max HP. But it will alert nearby enemy and they will soon turn hostile. Moreover, this resurrection ability will only be available if players fulfill certain condition, though we still don’t know what this condition is. Due to this element, certain players are afraid that this game can be too easy. But judging by the trailers and gameplay demo, we believe players will wish for this mechanic to exist in game. Interesting enough, there is a logic reason why Sekiro can resurrect. According to Tokyo Game Show 2018 trailer, there is a line said by his young lord that: As long as Sekiro is bound with his lord’s blood, he will never die and eventually fulfill his mission to protect his master. Some people speculate that this is a kind of spiritual bond, while some others think that there is some kind of magic here since the game actually does feature magical elements like the Corrupted Monk boss. As mentioned, Sculptor’s Idol will be this game’s version of Bonfire. Similar to Bonfire, Sculptor’s Idol acts as the game’s checkpoint. 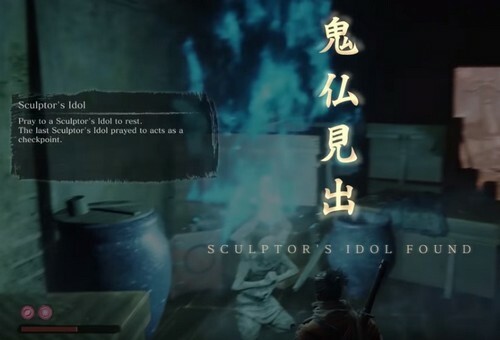 Every time Sekiro dies (for real), he will be resurrected back at the activated Sculptor’s Idol. When meditating (or resting in case of Bonfire) at the idol, Sekiro’s health will be healed to full and his Healing Gourd (which is the Estus Flask version of this game) will be fully refilled. Since Sekiro Shadows Die Twice is not a RPG, we still don’t know what the other functions of Sculptor’s Idol are. The gameplay demo did not show much of its other function. For now, we guess that players can select what kind of Shinobi Prosthetic gadgets players want to equip, sorting or storing their items. Players can unlock more Shinobi Prosthetic gadgets as the game progresses, which will highly be the case. It’s possible that players will be able to unlock Skills/Movesets in later progression. The reason for this speculation is that in Tokyo Game Show 2018 trailer, there is a scene where Sekiro performs wall-jumping, which was not included in the previous E3 gameplay demo. Finally, we have Boss Fight. If you have experienced Souls-Borne games before, you will know that boss fights in these games are extremely tough. Surely some bosses are rather easy (like the Cursed-Rotten Greatwood in Dark Souls 3), but there are many other bosses which can be so frustrating that you only want to smash your controller (or keyboard and mouse if you are willing to play with them). So how about bosses in Sekiro Shadows Die Twice? 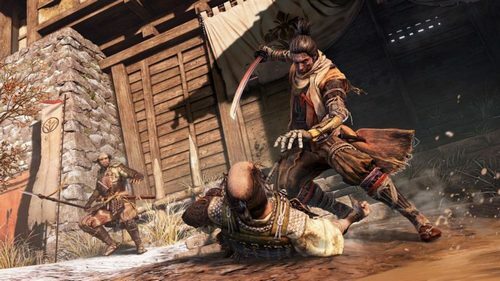 Here’s the good news: it seems bosses in Sekiro Shadows Die Twice will still be as challenging as ever, possibly even more challenging than any bosses FromSoft has designed before. The Corrupted Monk boss in the gameplay demo is great example here. This boss has three phases, yet only two were showed in Tokyo Game Show 2018 showcase (possibly because they don’t want to spoil too much). She (yeah this boss is a woman) is so difficult that many people playing the beta could not defeat. In the first phase, she only uses her halberd with combination between blockable and unblockable attacks (which is already challenging). Then in second phase, she creates an illusion which causes the surroundings to be murky, and then summons shadows which constantly attacking Sekiro. Supposedly there was a final phase which unfortunately removed from the Tokyo Game Show 2018 showcase. But even so, the boss fight looks extremely smooth and cool. And when players manage to defeat the boss, there is an awesome animation when Sekiro pulls out his sword on his back – Fushigiri the Undead Slayer – and uses it to finish the boss. Overall, the entire experience truly lives to FromSoftware’s boss-fight trademark and we can’t wait to get into this game for real in March 2019! And what about you? 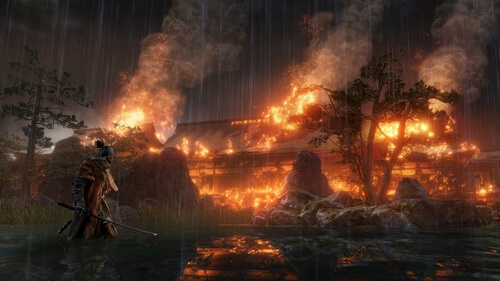 What do you think of Sekiro Shadows Die Twice? Feel free to share with us and for now, thank you and stay tune for more news in the future!